This week’s blog post comes from Brad Knowles, Interloc’s Vice President of Canadian Operations. Brad has more than 20 year’s experience working with Asset Management software. Brad spends a large percentage of his time in Calgary where he focuses on the Oil & Gas sector, working with clients such as Cenovus, Connacher Oil, Legacy Oil, Encana, and Athabasca Oil. 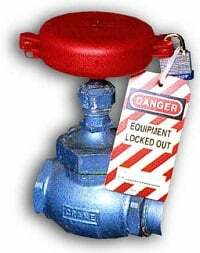 In Maximo Oil & Gas, there are two main uses for isolations: Lock Out / Tag Out (LOTO) and Interlock Bypass. This post will discuss how to track these two operations using Maximo for Oil & Gas 7.5. Traditionally, tracking these operations has been a challenge with Maximo. However with the release of Maximo for Oil & Gas 7.5, IBM has added in a new application for tracking Work Permits with has an enhanced section for managing LOTO Plans. While this automation is needed, many Maximo users still want to maintain control using their paper work permit process, and also prefer enhanced visibility into required LOTO’s and Interlock Bypasses on the work order before they are issued to the maintenance crew. Cloned Work Permit Application – the Work Permit application was cloned. Cloning the Work Permit application provides the option for using electronic permits in the future. All the unnecessary fields and tabs are hidden, so that the typical user would not see all the extra data required for a Work Permit. A number of labels in the application were adjusted for clarity. Two permit types were created: LOTO and Interlock. (It is quite easy to expand this list but I am keeping to the original two for this article.) A section was added at the bottom of the isolations to show any other isolations configured for the same Asset or Location, which provides beneficial visibility in the event that an isolation may already exist and can be used instead of creating another one. Assets Oil – A section was added to the Asset tab to show a list of Active Isolations for the selected Asset. Typically, there is not a large number of common Asset isolations, but for safety reasons this was added as an extra precaution. Locations Oil - A section was added to the Location tab to show a list of Active Isolations for the selected Location. This change is very useful as many valves can be defined for Isolations, but not necessarily defined as an Asset, so the Location was commonly used. Work Order Tracking Oil – A section was added to the Related Records tab to show a list of Active Isolations for the selected Work Order, Asset and/or Location. This section easily identifies required isolations for this work order and any conflicts across the location or asset. Start Centers – A separate start center was created to display the status of isolations. There were a number of different result sets (sections) defined. A few of these include: Work Orders waiting for an Isolation, Isolations Due in 7 days, Isolations past their Finish date but remain Active, and Active Interlock Bypasses. The purpose of these Start Centers is to review the Interlock Bypasses on a weekly basis to verify if they are still required. Why were these changes made Maximo for Oil & Gas 7.5? The primary purpose for these changes was safety, especially dealing with LOTO type isolations; however, these changes also provide the opportunity for improved operational efficiency. Managing isolations in this manner provides timely management when reviewing the Interlock bypasses and determining when they could be removed. Since these bypasses were never meant to be permanent changes, or as a means to mitigate the use of an MOC (Management of Change) process, the Interlock Bypass process needs to be managed. These processes also enable the Operations and Maintenance personnel to work closer together within Maximo, elevating Maximo beyond a standard maintenance tool. These changes have been discussed with the IBM Product Manager for Maximo Oil & Gas in detail. Because of the inherent value of these changes, I would not be surprised to see an enhancement to Maximo bringing this functionality, or similar functionality, into the Maximo Oil & Gas product in the near future. What do you think of the enhancements to Maximo Oil & Gas 7.5? How is your organization using them? Have a question on how to manage isolations in Maximo? Feel free to email Brad directly.